Training your hunting dog does not require acres of fields or heavy cover to get results out of your dog. What I call "backyard training" can be done in just that... your backyard. No matter how small your back yard is, training can still take place. Even if your yard is as small as my son Travis' yard in an apartment building in Boston, there is still opportunity to train your dog. The training that can be done is the hup, hold, some table work and obedience - but most of all, it is insuring strict compliance with each command. In a small yard, set up a table about 30 inches off the ground and at least nine square feet of area. For instance, this could be one that is 3' x 3' square. Use this table as one of your main tools for training your dog. The table can be in the middle of the yard or in a corner. Start each session with the dog from the table. Walk him out from the house or kennel on leash to the table. Teach him to jump up on the table and sit quietly. You may give him a treat or have him hold a retrieving dummy. Make it a very comfortable, exciting and rewarding place for the dog to be. 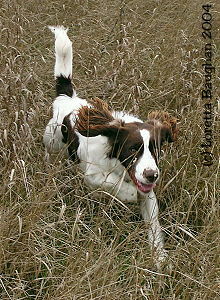 Our springers can hardly wait to get from the kennel to the training wagon and then, to the table. They know that everything good happens on the table. Other backyard training activities involve heel on leash, hup in place and heel, again. Putting a retrieving dummy in the pup’s mouth and allowing him to carry it around while on leash and at heel is also a good technique for reinforcing in the pup's mind that he doesn’t have to shy away from you or play keep away with you regarding the dummy. He will learn that when you take it, he will have another chance to fetch, retrieve and carry it. Using the cane pole with a wing on a string also does not take up much room. You can use it to run the energy out of a dog just by having them chase the wing around in a circle for six to ten minutes. These backyard activities are very focused and keep a dog sharp. They serve to keep the dog in the correct learning mode for future training and also reinforces to the dog his correct rank in the pecking order. Communication in dog training is critical to the success of the training program set up for a gun dog. 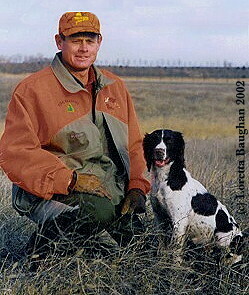 Communication between dog and trainer achieves the desired result in the gun dog. Communication between the owner and trainer is also a very important aspect of the training program. Over the years, I have been lax in communicating the progress of the dogs - or lack of progress in the dogs - to the owners. Sometimes, I assume the owner understands that their dog has a learning curve and I need to work with that curve. Other times, I assume the owner understands when I say the dog is learning to retrieve or getting ‘better’ on obedience or quartering well - then when they come to see their dog in the field, it looks as though no progress has been made. "However, in training gun dogs, I believe that the owner should be more involved in the training process since they are the ones who will be hunting over the dog and living with it from day to day." Progress is when we can have the dog in for a couple of weeks of training, the owner sees a difference in the dog when they come to watch and that particular session goes very well for the dog, the trainer and the owner. At other times, sessions just don’t work out well or the expectations of the owner were out of sync with the learning curve of the dog. I often make the mistake of thinking the dog can progress very quickly in a short time frame and tend to get the owner’s expectation set higher than what I can get out of the dog. This assumption stems from the fact that I am concerned, sometimes more than the owner, with the total cost of the training program and obviously, the longer the dog is in, the higher the cost of the training. My goal is always to bring out the best in the dog with the resources, time frame and budget available. It would be far easier for us trainers to get the dog in for training and leave it here until we get the dog fully trained then send it home to the owner. We have several training clients like this and it works out very well for everyone - as the results are a well trained dog. Many dog training programs are set up this way. However, in training gun dogs, I believe that the owner should be more involved in the training process since they are the ones who will be hunting over the dog and living with it from day to day. We offer a wide array of options for each dog and owner to be able to set up the best situation with the client. Communicating the desired goal to the trainer, the type of hunting and ability of the dog is necessary. The best situation with a new young dog is to get the dog and owner in for an introductory session. This enables us to see the quality of the dog while the owner can see how we operate with the training. We can also provide the owner with some homework assignments to work on before coming back for another session. Communication is key, again. We can then set up a training program - whether it is once a week sessions with the owner, in house training for a month or two or longer with the owner coming in to learn how to operate the dog. Another possibility involves once a week sessions then by in house training for a few weeks followed by going back home for more once a week sessions - or any combination of options. Remember that our goal for the gun dog program is to produce a dog you can be proud to hunt over and feel comfortable handling. Communicating this goal on a weekly basis with progress reports is an aspect of our training program that we strive to achieve.